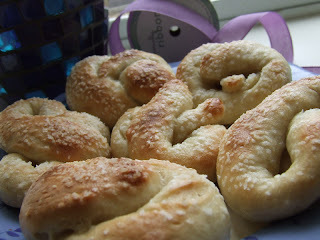 ...in the Great Pretzel Bake Off of Lent 2008 is the recipe posted by Women for Faith and Family and recommended by Melissa. They weren't pretty (probably due to my lack of skill, not the recipe), but they tasted oh so good! Their yummy smell even woke the living dead Professor who ate two of them for lunch before returning to his cave to itch in solitude. He broke out in hives this morning so we have no doubt that he has a virus and we are keeping him quarantined until it is gone! These soft, warm treats received two thumbs up from the judges here; however we plan on testing a new recipe every Friday so tune in sometime before Easter to see which one is declared the family favorite. I hope your boy is feeling better soon! They look yummy; we'll have to try that recipe!